Last night, The Voice: Season Seven Final Four (Matt McAndrew, Craig Wayne Boyd, Damien and Chris Jamison) gave outstanding performances to prove to America why they should join Javier Colon, Jermaine Paul, Cassadee Pope, Danielle Bradbury, Tessanne Chin and Josh Kauffman in the winner’s circle! Who won the Universal Music Group recording contract? Which artist was named The Voice? After recapping the final performance night, the Top 20 reunited on the stage to perform an epic cover of Bastille’s “Pompeii.” It was great to see old faces such as DaNica, Elyjuh, Sugar, Ricky, Anita and all three Taylors! Once everyone left the stage, it was time for the first “friend” performance of the night! Craig Wayne Boyd recruited a couple of Team Pharrell starlets DaNica Shirey and Sugar Joans and former Team Blake member Taylor Brashears to perform Georgia Satellites’ “Keep Your Hands to Yourself.” The quartet gave a feisty performance and put a huge smile on my face! Grammy nominated artist Hozier made his Voice debut with his powerful “Take Me to Church.” It was interesting to hear the artist perform the song in a lower vocal register. However, I wished that he incorporated the contestants into the performance. Chris decided to recruit his best friends Ryan Sill (yuck), Taylor Phelan (should have been in Chris’ place), Luke Wade (gross) and Ricky Manning (why was he cut again) to perform Lloyd’s “Dedication to My Ex.” Unfortunately, it was boring and I was tired of hearing all of the screaming ladies! I wish Howard Stern was there to buzz them! Matt McAndrew was one lucky guy! He had the chance to perform with Fall Out Boy! He reunited with his former Team Adam advisor Pete Wentz and his crew to perform “Centuries.” It was great to see Matt finally rock out on the show and I think he challenged Pete Wentz note-for-note! After paying tribute to Pharrell a la Star Wars, the ladies of The Voice (Jean, DaNica, Sugar and Mia) tackled Jessie J’s “Bang Bang” and rocked the house! The Voice audience ignited as Bruno Mars joined superstar producer Mark Ronson with their performance of “Uptown Funk.” It was awesome to see Bruno Mars light up the stage and I hope that this song gets a future Grammy nomination. It has been 10 years since Lynyrd Skynyrd took a stage of a Reality TV show! I remembered watching the Southern rock perform “Sweet Home Alabama” with Bo Bice on American Idol. Now, Craig Wayne Boyd was the latest rocker to join the band to perform their iconic hit! Academy Award-winning actress Jennifer Hudson has made a lot of dreams come true! She sang with two impeccable performers: Idol winner Candice Glover and AGT finalist Quintavious Johnson. Now, Team Adam’s Damien’s dream came true when he joined the Grammy winner with her latest Grammy-nominated smash: “It’s Your World.” The duet gave me chills! Matt McAndrew picked a fantastic group of artists to perform “Go Your Own Way.” Mia, Taylor John Williams, Taylor Phelan and Sugar Joans returned to the stage to perform the Fleetwood Mac classic! I danced and could not stop singing along with the quintet! In fact, they could challenge the American Idol judges with their rendition. Damien concluded the Bring Back performances by bringing back Elyjuh Rene, Anita Antoinette and DaNica Shirey to tackle “Ain’t No Mountain High Enough.” It was the first group performance to give me chills and I loved hearing them together! Valerie Simpson and the late Nicholas Ashford would be so proud of all four of them. 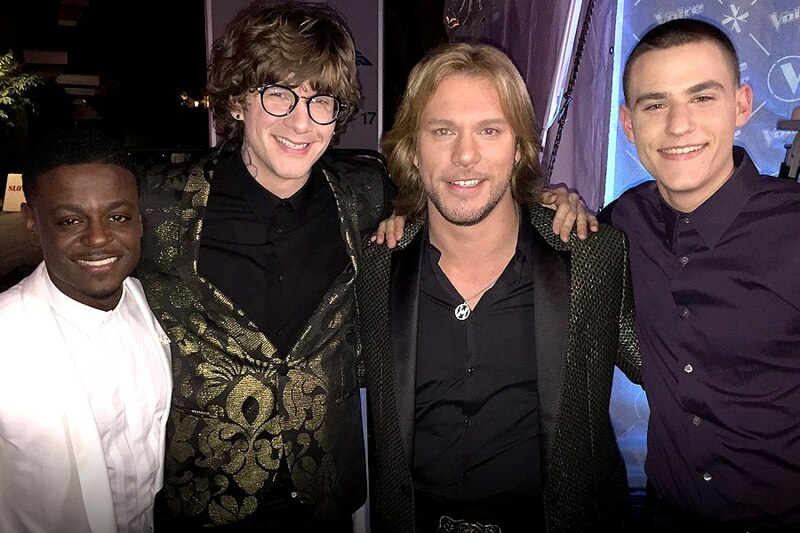 Chris Jamison closed the night of contestants’ performances by performing with former Voice UK coach Jessie J with her latest single: “Masterpiece.” They sounded fantastic together and unlike several of the guest performers…she really let Chris shine! Ok…now it was time for the results! This means the winner of “The Voice: Season Seven” is….Craig Wayne Boyd!!!! Congratulations to Craig! You can catch him on “The Today Show” tomorrow morning! I will be back next year with more “Voice” recaps and the return of the Queen of “The Voice”…Christina Aguilera!